This evening in the sweltering Georgia heat our Princess and I took Miss Sophie out for her evening constitutional. Many are bidding summer adieu and proclaiming this the last weekend of summer. Yeah, I don’t think Georgia got the memo. She’s still blazing like a great ball of fire. As we walked along, I noticed this tree in one of the neighbors’ yards. The summer evenings at my Granny’s. With my cousins. They were magical. When dusk hit, the stars came out, and the air would stir and cool down just enough to let us run around chasing the lightning bugs. Granny would sit on the porch and watch us, escaping the heat of the day that was still trapped inside the house. We ran and laughed and played beneath the walnut and cedar trees. 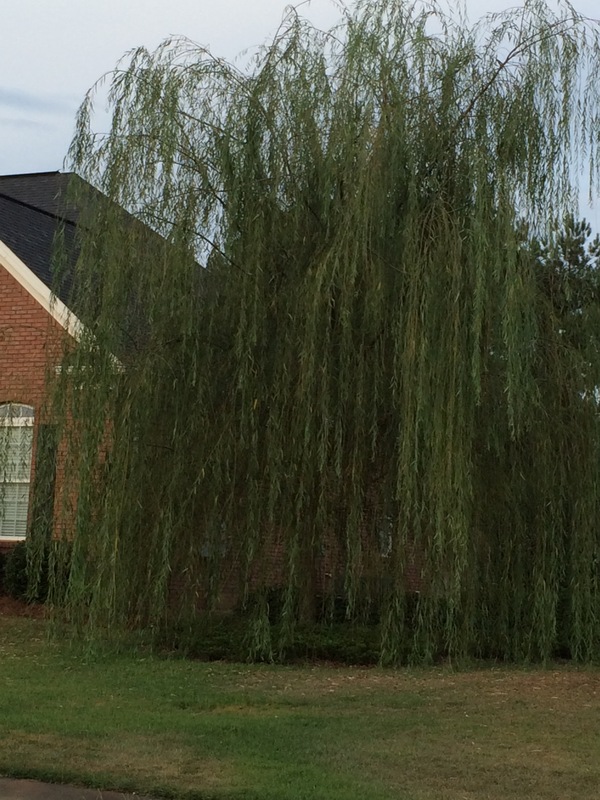 And on one side of the yard was the weeping willow. She mystified me then. With her long flowing tendrils blowing gently in the breeze. It felt like I could hide away from the world within her arms. I’m sure I could still be seen, but tucked away in there, I felt safe. I was puzzled by her sadness though. Something of a literalist back then, I wondered what on earth she was so sad about. And so I sat in the quiet with her sometimes. Just listening. And thinking. She still mystifies me. I think the weeping willow is the poet of the tree family. She bends in the wind far more than the others, and yet she is still strong. In my heart I feel like she can understand and empathize with me and still be a stalwart of strength for those who need to lean on her. I’ve always had a thing for anthropomorphizing. Sorry, I digress. Tonight I’m thankful for the whimsical and happy memories of days gone by–mine and those of our Princess. I hope that she will find a way to make many more. I am glad I got to hear where her heart and mind are tonight. What better time to recall and remember and share than when the seasons are about to change and summer is about to end? Hoping you all have memories of your own good old days to take with you into the seasons ahead. As part of our program this year, we are reading books that have movies adapted from them. (Ahem. Doesn’t that sound nice–“program”? Makes me sound much more organized than I actually am. Yes, let’s go with that–program.) We are reading and then watching. I found out that Emma Watson (of Harry Potter fame) stars in a movie called “Ballet Shoes”(2008) that is based on a book with the same title by Noel Streatfeild (originally published in 1937). I just knew this would be a winner with our Princess because she is a ballerina and she loves Hermione. Win win. She was asking me to recommend something for her to read the other day (she has finally finished the whole Harry Potter series–huge victory y’all, she wasn’t reading until after she turned seven and now she is not quite ten–thankful, so thankful). I asked her if she’d read “Ballet Shoes” yet. Word? I was not aware of a word. I mean, we’re talking 1937 here, right? What word could it be? I noticed her reading it today. Sometimes she’s like that. Just needs a couple of days to process things in her mind and heart. I spent much of the time reading aloud “Benjamin West and His Cat Grimalkin” trying to remember to substitute another word for “Indians.” It brought troubling images to her mind for some reason. Now, no problem. I don’t even know. I choose not to question it. It kind of makes life easier. Yesterday a friend shared the video of the little boy who was not happy about his Mama announcing he was going to be a big brother. Again. He gives his Mama a talking to, and yes, I giggled when he used the big word. You can watch it here if you like. After watching it, I thought about the videos that people have been sharing of a little guy called “Kid President.” I decided to check one out before getting back to the dishes and what not. Lots and lots of what nots. Y’all. He is adorable. And the truth he speaks all while making us laugh. But I’m sort of mixed up like that. My two were laughing so hard by the time it was over. And it wasn’t the funny sound one. It was #14. Look at the sauce on your own shirt before you go pointing at the sauce on someone else’s. But last night as I was thinking back over what Kid President was saying, I thought about what grace-filled words those are. Yeah, you might have some on your shirt, but looka here. You aren’t alone. Don’t be embarrassed. I have barbecue sauce (or spaghetti or salsa or chili or fruit smoothie *sigh*) on my shirt too. I would not mind one bit if a shirt that says this showed up in my drawer. Preferably in white so I can wear it often and stain it well. That’s kind of my thing, you know. Staining shirts. I’m why Tide Stainstick was invented. After the laughter settled a bit, I told my crew we could watch more later–we had times tables and spelling words and China to explore. Cooter was still laughing his head off, saying, “He said, ‘Put barbecue sauce on your shirt…..'” as he rolled off in another fit of laughter. Yeah, he doesn’t get it. It’s okay. He’s still really cute. I explained that to my knowledge he’s not and so, that would be a no. But I get it. Who wouldn’t want someone so full of joy and laughter and honest insight in their family? Tonight I’m thankful for a world where little boys can lead us on the right paths of thinking and caring and loving on folks. I give thanks for the laughter and joy of my littles and for my girl who has been able not only to read but also to say “orphan”–who gets that we all need to be a part of taking care of others in this world. Y’all go eat some barbecue, get messy, and love on folks. We ALL got stuff to do. What would you do when your seven-year old young’un has done “run oft” when he’s supposed to be doing his school lessons? What if you find him curled up on the couch reading a book? Yeah, it’s a little harder to be firm, but still, he needs to work on his handwriting and his math, right? Yes. He does. Trust me on this. What if said book that he is curled up with is the Good Book? I know. I know. I got nothing. I did tell him to please put it away and come back to work on his writing. After all, adjectives are fun too. Oh y’all. How do you argue with that? Finally he did come back to working on writing his sentences all about Star Wars (thankful for the soul that came up with the idea of Math, Reading, and Writing workbooks that are Star Wars-centric! No way she’s getting paid enough–and yes, I’m sure it’s a woman–a woman who has pulled her hair out trying to get her child to quit talking about Star Wars and get.his.schoolwork.done). He circled the nouns and underlined the adjectives like a pro. Finally. Still, he loves to talk while he’s doing all of this. This little guy who did not talk much and had me quite worried about it until he was well over two years old. He’s been making up for it ever since. Which, don’t get me wrong, I love hearing his voice. And his thoughts. It’s just that when his 9-year-old sister is sitting next to him trying to focus on word problems and times tables and begging me to buy her ear plugs…..it’s not conducive to the “happy happy happy” place I like to be. The way my little guy said “love.” I realize his perception of the story is a little south of standard but still, I almost started bawling. For all of his chattering, there’s some deep stuff flowing in there too. And it’s not all Star Wars either. What do I even do with that? Say, “Hush up now and finish your schoolwork”? No. You just can’t, can you? We have days like this. Days when things are good, even if the book learnin’ doesn’t necessarily go as planned. When my children are thinking and the thoughts they share are fascinating. He nodded as his tongue worked the side of his mouth and he continued writing. Since you put it that way….. This raising children is surely an adventure and teaching them at home is sometimes like an adventure on steroids. All in the same day I get to hear the history of the world according to Star Wars, how the world was actually created according to the Good Book, how many Legos it takes to build a cantina from Star Wars, moans and groans about one more page of writing or math (depends on the day), and that people were afraid of how love would change the world. That last one–I think some folks still are, don’t you? Afraid of loving all like God and how that might change the world? Tonight I’m thankful for a day full of good things–of teaching my children and seeing some of it stick, of working alongside them to clean up or prepare a meal, of listening to their jokes, hopes, dreams, silly stories, and fears. I give thanks that I often learn more than I teach when I hang out with this crew. That their hearts and minds seem to be growing in the right direction–that means everything to me. And that they know that love can change the world? Now if only I can get him to give up those “fun to write” capital B’s. Love, the world-changing kind, to all. Wait. Cute little boy with no teeth on top say what now? She actually paused a moment to think about it and her face brightened. Good to know. Our Princess can be bought with a TV. Okay then. Y’all. Methinks my children have had too much death to deal with in the past four years. They’re just too young. And yet–well, they know a little bit more about life too now, don’t they? Still, I’d rather them not be talking about taking my stuff just yet, if it’s all the same to them, thankyouverymuch. So just to keep the battles at bay and in an effort to keep everyone getting along when it becomes necessary and the situation presents itself, here is a little letter to tuck away for them to read later. Much later I hope. First of all, I love y’all. And no matter how many times I told y’all you were making me crazy, I still love y’all. Each and every precious and tender and frustrating moment. You are my world and my life is better because of each one of you. Okay, lose the “if only’s.” It is what it is. Whatever it was. Just let it go. (Hopefully enough time has passed that you’re okay with me bringing that song to memory again.) In the words of Uncle Bubba, it’s never that serious. Do NOT get rid of my Raggedy Ann dolls. I am just sayin’. I’ve never quite gotten over the one I had to let go of all those years ago. (long story) So they are very precious. Especially the one Aunt made for me. Somebody, for the love of all things Raggedy and old, find a shelf and set them out in your home. What do you mean, they don’t match your décor? Next. I am just kidding in the previous Paragraph, Section All. Get rid of whatever you want to. Yes. I’m sentimental. Yes. I kept a lot of Maemae and Cap’s and Granny’s and Aunt W’s and Aunt M’s and everyone’s things. I did. But that’s me. It doesn’t have to be you. If it is, okay, embrace it. But don’t hang on to something because you think I’d want you to or that it would bother me if you didn’t. I won’t care. I will have headed on up to the House, and it won’t matter anymore. Unless it matters to you. And that’s all I have to say on that. Please forgive me the mess I leave you. I’m not like my Mama in that respect. As Cap would say, “lots of detritus.” So unless I’m able to reinvent myself and change a lot of my ways, I’m just sorry. I don’t know why I keep letters and cards and little bits of memories tucked away. I’m trying to change. For all of your sakes. But you know. Old dog, new tricks, and all of that. So yes. I really am sorry. The greatest gifts Mama and Daddy left me were the ones they left behind–the ones who have been here to hug and love on us and ask if we’re over our colds and how was dance or swim lessons or is the math getting any better and how is Aub liking her college classes…..those are our gifts. And I hope you will find treasure in those we’ve shared our lives with who I am sure will continue to love on you. Love on them right back, okay? 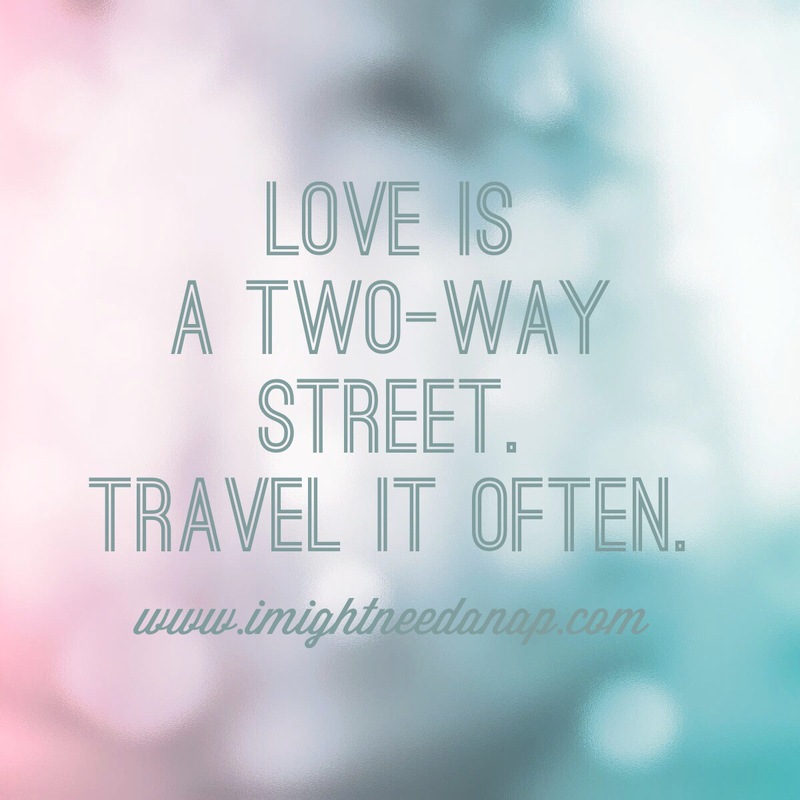 Love is a two-way street. Travel it frequently. I love you all. Right now you are all snoozing away. I don’t know who y’all decided would be best to handle my estate yesterday, but here’s the thing. You all are responsible for it. For how I’m remembered and for how you can still feel my love close. It will be when you are together, sharing stories–the sweet and funny and embarrassing and sad and triumphant. Do that. Sharing. Holding close to each other. A lot. Okay. Really, that’s all I care about. The rest is just stuff. Do what you will. Or don’t. Just love. That’s what I’m leaving you and what I’m leaving you as a family heirloom to share with yours. And so on. Love. And lots of it. It’s been over a year and a half since my dearfriend had her out-patient procedure. The one that gave us the words that we go back to and use with each other so much. My dearfriend, in her semi-conscious state, felt awful for this other lady in the room who was having a very difficult time in recovery. After all, Shirley wasn’t even breathing. And then, as she came to even more, it hit her. The nurse was talking to her. Only her name isn’t Shirley. The story is a lot funnier when she tells it. (Especially the way she says, “So then I asked the nurse, ‘Are you talking to ME? '”) But most things are. She can take those everyday mundane and even hard things and have us both laughing over them by the end of the story. I love having folks like that in my posse. Don’t you? We have laughed and laughed over that one. There she was feeling bad for poor Shirley who wasn’t breathing well enough on her own, and turns out it was her. Oh me. Y’all hang on, I gotta wipe my eyes from laughing so hard. I told my Mama this story shortly after my friend shared it. We had a good chuckle over it ourselves. That’s not my Mama’s name either, but I was hoping deep inside, beneath where she was resting so peacefully, that maybe it would stir a giggle and she’d remember and be able to breathe on her own again. And maybe, just maybe, like my dearfriend, I was the one who needed to be reminded to breathe. Sometimes in the midst of hard times and stress and anxiety-filled days and nights, we tend to forget to do just that, don’t we? And we need to be reminded. To stop. And take a deep breath. I have another sisterfriend who writes and shares stories about “finding balance and grace in the midst of life,” over at Centering Down. I am blessed that I get to share stories both on-line and off with her. She has a calming spirit, and she knows all about breathing. As a matter of fact, she has published her 100th post, and it is about breathing. Y’all take a minute and go read “Calming Anxiety with Breathing Techniques.” It’s good stuff, and I can attest to the fact that breathing does help with anxiety and stress. I just have to be reminded sometimes. After all, if it’s good enough for Shirley…..well…..
Congratulations to my friend on her writing triumph. And thanks to my dearfriend who allowed me to share her story and gives me the gift of an hour with her each week while we wait for our girls–where we laugh and remind each other to breathe. And we call each other Shirley. It’s become a term of affection now….. So we’re having some work done here at the house. Good work. Nothing wrong. Just taking one more step to make it ours. I’m very much like my Daddy, who, in conversation with his brother-in-law one time, said something about Blackberry Flats finally starting to feel like home. I was grown y’all. They had been living there at least twenty years. And we’ve only been here seven. Slowly but surely, it’s starting to feel a little more comfortable. Last night I had a dream that the guys didn’t come today. That I didn’t hear from them, wondered what had happened, if they were okay. And then this morning, I got a phone call. I dream it, he makes it happen. He’s kind of magical like that. Or at the least very talented. And when I told him I like things “old-fashioned,” he Wrote. It. Down. So yes, he called. One of the guys who has been working with him had a death in his family–his uncle. It sort of threw things off on them being able to get much done today, my dream builder explained. So he thought they’d take today to get little things caught up on, and they’d plan on being back here tomorrow. His tone was somewhat apologetic. But it was I who was sorry. Sorry for this new friend of mine–the artist with the wood and tile and putty–who lost someone he loves. My heart aches for him and his mother, with whom he is spending time helping her through this right now. My house was quiet today. No sounds of power tools or good-natured bantering. No doors opening and closing. No barking by Miss Sophie to “warn” me that someone was on the premises. Over and over and over. Oh, we had school. Math. Ah, well. That is not usually a quiet exercise around here anyway. But overall it was quiet. And there was a bit of Fall teasing us today too, if I’m not wishful thinking here. Every time the oddness of the quiet reminded me of who wasn’t here, it also reminded me of a life lost. Of the sadness in a family’s heart. Of the burden of being the ones left behind that they carry now. Of learning how to live all over again–without this person in their world. Tonight I give thanks for the quiet. For the opportunity to grieve alongside this family. I think too often we pass over deaths that affect others more and move on, back to our lives and our schedules and what comes next. Or we are altogether oblivious of the loss. We don’t mean to be insensitive or unkind and unfeeling. It’s just what we do. We skim the obituaries with our morning coffee. We pull over to the side of the road when a procession goes by. If we knew them or someone close to them, we plan to go to the visitation between supper and our program at 9 pm on TV. We take leave or a long lunch break to go to the funeral. We pass the folks in the hall a week later and ask them how they are doing. We listen, do the side tilt nod, and pat the person on the shoulder, saying something to the effect of “I’m thinking about you” or “It will get better” or “Call if I can do anything,” not even being able to fathom what that might look like. We try. So today was a precious and raw and beautiful reminder to me about sitting with others in their grief. In the quiet moments of this day, I thought about this young man whom I barely know, whose personality is delightful and who is a hard worker and a skilled and talented craftsman. I remembered his uncle, whose name I don’t even know. But a candle has been extinguished, and the world is a different place than it was before he died. Before any of them died. And sometimes that is what we need most–to have the world acknowledge that the world is different without this person we love so dearly. To have the world stop spinning for a moment or two. I’m thankful for the moments that mine stopped spinning today. It wasn’t of my own choosing, but I give thanks for it. And for the reminder that we all are a part of each other’s story, even if on the periphery. And we can give each other the gift of pausing and pulling over to the side of the road, literally and figuratively, when someone dies. Each one who leaves this world matters. It changes us all.